One of my favorite pieces of equipment in starting a drivy dog is a long stick. Drive is related to distance. The closer to the stock the dog is the higher it is in drive, both general drive and prey drive. It is important to get the dog out to where he is not in overdrive. Out to where the dog is in the thinking part of his brain. Sorting poles (also called stock sticks), sorting paddles (also called rattle paddles) and rakes are too short to get many dogs out to the distance they need to be. Bamboo poles are much better suited to this task. PVC pipes will work too, but they are not as good as bamboo as they come in only 10 foot lengths, are heavier than bamboo and bend over at the ends because they aren’t as rigid as bamboo. However sometimes, PVC pipe is all that is available locally and so it is settled for. Fortunately, there are many suppliers of bamboo poles to be found on the web. In many places, it is possible to grow your own bamboo. I am fortunate to have several groves growing wild nearby that I can harvest from. A little about the growth of bamboo: When first planted, there is not much energy in the plant. So, the first year’s growth will be a few small shoots. As the years go by, the shoots put out each year will get more abundant and taller until they reach max height for the growing conditions. A particular variety will grow to different max heights in different areas. A shoot will grow to as tall as it is going to get in its first growing season, but will live for many years. The first year the shoot is thin and weak, but it gets woodier and stronger each year until about year 7. So, don’t cut first year shoots for poles. Wait until they are a few years old. Harvesting with a saw is less likely to cause splitting than pruners. I like poles 10 to 20 feet in length and 1 to 2 inches in diameter. A 20-footer needs a large unobstructed area to work in. Beware of overhanging trees that will grab it. I choose the individual stick based on the dog’s behavior. For very weak or low drive dogs or dogs with lots of yield to pressure, I will forget about the bamboo and use a sorting pole. It is not my practice to hit the dog with the stick. A stick is hard and can cause injury to the dog. Plus hitting isn’t particularly effective. It is too momentary a correction to overcome the drive of a hyped up dog or the reward of a grip. There is also the risk of the stick poking a dog’s eye. Therefore, my beginning dog sticks have soda bottles on the end. If the dog does accidentally get hit, he doesn’t get hurt. Some of the bottles have a few pebbles in them to make noise. Some don’t. Again it depends on the dog. Some dogs won’t work with a noisy stick. Other dogs need the extra oomph to keep them out. Some of my sticks have bottles on both ends. These are very useful for really pushy dogs that don't give me the time to get the right end of the stick in front of them. Instead of hitting the dog with the stick, I wave it (with strong body language behind it), bang the ground with it, or (usually only for puppies) push into the dog’s side. Now, I will explain how to bottle a stick. Choose a stick that is long, strong, and reasonably straight. The diameter of the end should be equal to or slightly less than the inner diameter of your bottle. You can cut off the tapering end to get a new end of correct diameter. Unless the bamboo is very, green, do not use pruners as they will split the wood. A saw is best for cutting bamboo. I use soft drink bottles and have used from 12 ounce to 2 liter sizes. If you use 2 inch bamboo, you will need to use a different type bottle with a larger mouth. The important trait is that the bottle be of thick, soft plastic. Beware many water bottles are ultra thin plastic and won’t hold up to this job. PVC pipe fits soda bottles perfectly. 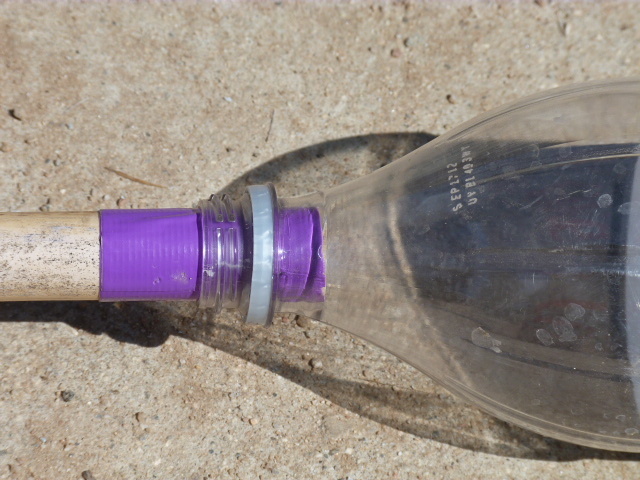 Here is what you will need to make your bottle pole. 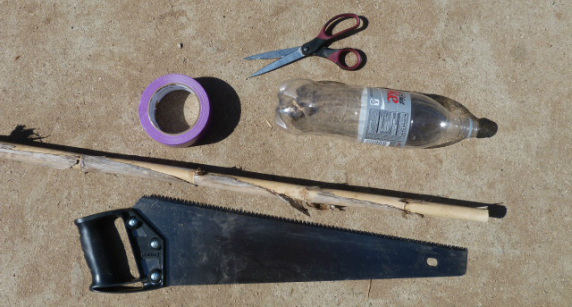 Bamboo pole, duct tape, scissors, saw, and tonic bottle. Saw off the end of the bamboo at the point you want to attach your bottle. If your bottle doesn’t fit the pole snugly, you can wrap the end of the pole with duct tape until it does. Also remove any leaves (dried dark stuff at right) that might get in the way of attaching the bottle. 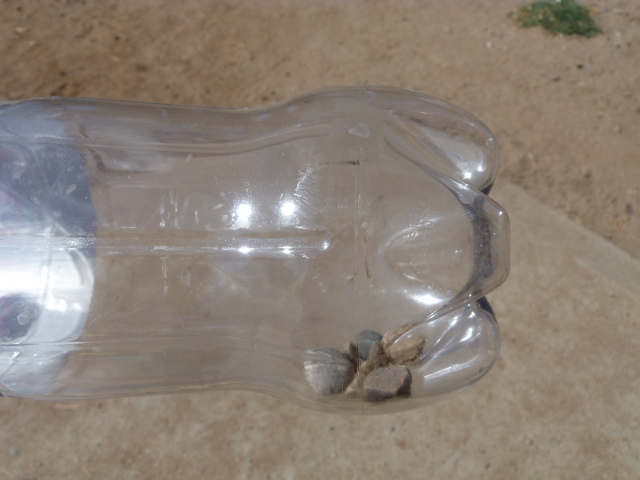 This bottle has a few pebbles in it to make noise. Only use a few pebbles. It actually makes more noise that way. Also too many pebbles adds too much weight. Make some sticks with pebbles and some without. It helps to use different color duct tape for noisy and quiet sticks. Stick the stick only into the neck of the bottle, not into the body of the bottle. This is important to prevent injury to the dog. It also protects the stick when banged on the ground. Tape neck of bottle securely to end of stick. 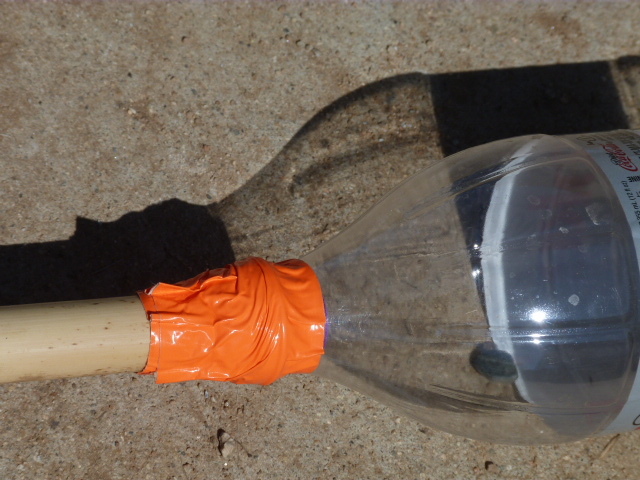 Wrap duct tape lengthwise all the way around bottle and onto stick. Keep taping bottle lengthwise until it is completely covered. Then wrap the neck area again. For bonus points, you can add some contrast to increase visibility.